Ben E. Hunter has performed nationally and locally for the past 20+ years as a reggae artist with seven studio albums recorded in New Orleans, Jamaica, and Los Angeles. New Orleans Afro-Caribbean Folk Music is a musical style that Ben created by combining his personal musical histories of reggae, New Orleans Mardi Gras Indian chants and West African drum rhythms. He is developing this genre through a musical library of all original songs based on his experiences growing up in the Treme before and after hurricane Katrina. Hunter has recorded three studio albums in this pioneering new New Orleans’ genre: “Traveler,” “The Nature of Things” and “Break out Bold.” He is most known for his legendary reggae performance and recording history in New Orleans. 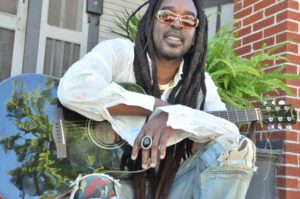 As a regular and ultimately trend-setting performer at Café Brazil on Frenchmen St. for over a decade prior to Katrina, he was the creator and bandleader for both, “Ben Hunter & The Plantation Posse” and “Ben Hunter & Crucial Roots”, producing albums including “Voodoo Reggae,” “Reality Check,” “Soul Avenger Live Intergalactic” and “A Freedom Song”. Locally, Ben has headlined at Tipitina’s, The House of Blues (as one of the first local acts to ever headline HOB), Essence Music Fest and performed at New Orleans Jazz & Heritage Festival for eight consecutive years. Nationally and internationally, he performed as one of the headliners for the Bob Marley Festival Tour for five years and at Reggae Sun Splash in Montego Bay, Jamaica. These works earned him esteemed awards such as The Big Easy Award for Best Reggae/African and The Louisiana Film Festival Award for Best Music Video. Ben was also featured on the cover of Offbeat Magazine for his performance at the International Arts Festival, and again for Offbeat’s Ten Year Anniversary, honoring modern and historic New Orleans’ legends.